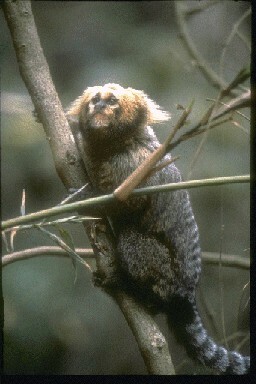 The Geoffroy’s Tufted-ear Marmoset was discovered by Humboldt in 1812. They are endemic to Brazil, and currently listed as a vulnerable species. They have a tan face, with grey hair on their crown. Around the edge of their face and ears white tufted hairs give this marmoset a unique appearance. They average around 20 cms in length, with their black-striped tail a further 29 cms on average. The males weigh around 230 up to 350 grams, and the females just under 200 grams. They feed on fruits, saps, insects, small mammals and other such food sources. A study took place with a number of Geoffroy’s Tufted-ear Marmosets in captivity. A recorded sound of a power drill was played and little reaction took place. A recorded sound of a hawk was then played, and the marmosets froze and exhibited anti-predatory behaviour. This tells us that they most probably use auditory cues as they were associating the sound with potential danger. Another study took place with captive Geoffroy’s Tufted-ear Marmosets in the San Diego Wild Animal Park. This time a model snake was left out at certain times in the morning and in the evening. Days later the marmosets continued to visually survey the area. This suggests that they are capable of using experiences to guide their antipredatory behaviour. This species is also known as the White-fronted Marmoset, and sometimes known as the White-fronted Monkey. They usually maintain social groups of around 15 to 20 marmosets. The gestation period for the Geoffroy’s Tufted-eared Marmoset is around 140-145 days before giving birth to one or two young marmosets. E-mail to add your Geoffroy’s Tufted-ear Marmoset related website. Oral presentation, 24th Meeting of the american society of primatologists.